You can have any colour you want, as long as it’s black. This quote attributed to Henry Ford represents the spirit of an age when means of production were scarce and demand was bigger than supply in first-world countries. Every product that hit the market was sold instantly. But the end of the post-war ushered in the age of the Consumer: growing choice, and cheaper prices, resulted in the discipline of Marketing spreading further in order for businesses to better understand and satisfy market needs. At the same time, TV provided a previously unseen advertising power to businesses, making it easier to influence the consumer. Then came the Internet, and the ubiquitous informed Consumer was born. Social Media gave everyone a voice, and TV stopped being the ultimate sales machine. Online reviews, forums and facebooks of the world put conversations before branding messages. Businesses started realising the real power of savvy consumers and felt pressure to become more customer centric. But the rise of people power doesn’t end there. Along with growing consumer power, trends in employment brought with it other challenges: a candidate driven market combined with a growing number of freelancers. Even though employee turnover may not be increasing as much as we would have thought, companies are striving to attract young talent, knowing that people are their best asset. But actions speak louder than words, and even if the “people first” message is everywhere, existing levels of disengagement in the workforce are appalling. If Social Media and the Internet have broken the old media model by bringing us closer to a “markets are conversations” mantra, Blockchain technology promises to cut out the middleman in economic transactions, hitting the foundations of commerce and institutions which guarantee identity and security such as states, banks and corporations. 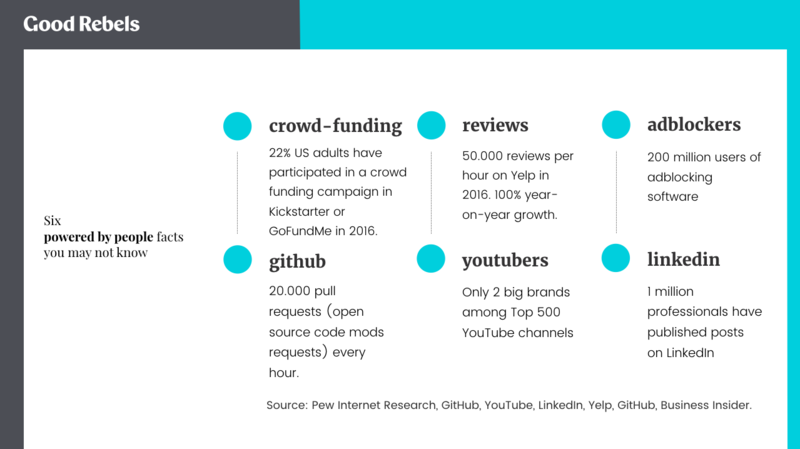 Hard data suggests that the world is powered by people more than ever before: fundraising platforms like Kickstarter, open software initiatives, growing citizen activism through platforms like Change.org and consumer reviews are at an all time high. The creation of Bitcoin represented a milestone of the anarcho-libertarian tech utopia: the ability to create and exchange money without centralized control. Most would say the Cluetrain Manifesto theses are outdated, but its spirit is still alive and kicking. Technology is taking decentralised collective action to a whole new level. But companies think they’re still in control and keep operating their business as usual. In a scrambled attempt to maintain this sense of control they roll out Customer Journey Mapping initiatives, Digital Transformation programs and naïf social media plans, however these actions only lead to self-deception. We start by helping companies become more digitally savvy. This is what we do on a daily basis. We gain their trust by making them smarter and by delivering measurable results and ROI that help them to connect with their customers. They become more Consumer and Co-worker centric. By gaining their trust day to day with our work, we are able to influence “strategic decisions” around their Consumer and Co-Worker journeys. We are finally able to transform our clients into Citizen-centred organizations. As trusted advisors, we’ll reach the highest decision level, thereby shaping companies that are more socially conscious and which contribute to improving society. 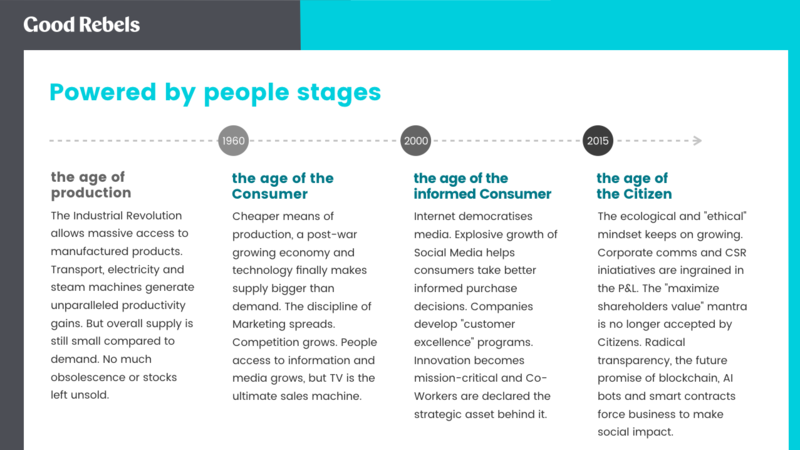 The rise of the conscious consumer leads us to predict the advent of the Age of the Citizen. 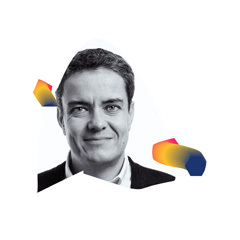 Thus, more and more companies are adopting human-centred strategies, and taking care of the Co-Worker and the Citizen journey in addition to the now ubiquitous Consumer journey. It will create a better world, while allowing businesses pay their shareholders back. Not a bad utopia, is it?